A back-up of all your patient contact data found in the family file. Ensure your scheduled appointments are backed up and immediately accessible in the event of a power outage, flood, inclement weather, natural disaster or server failure. A back-up pf all your patient insurance. A back-up of all your completed procedure codes. 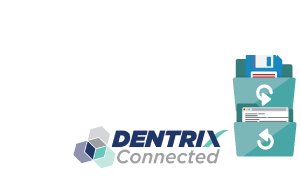 If in the event of a disaster our Peace of Mind Automatic Back-Up Certificate will ensure that your DPP Dentrix Connected Dashboard data will always be accessible online at anytime, reducing your liability and loss of revenue. Did Your Local Back-Up Fail? Within 48 hrs of request, we will provide you with a zipped file of the following tables: admin.patient, admin.referral, admin.address, admin.insured, admin.inscarrier, admin.aging, admin.fulldef, admin.fullproclog, admin.proccode, v_provider, v_staff. Unlock the power of next-level reporting with the DPP Advanced Reporting Dashboard. Advanced Reporting provides dentists with the ability to view scheduled appointments remotely, identify missing data in the patient family file, manage patient retention with inactive reports, and much more! Submit your request for a follow-up call from one of our Client Sales Managers to schedule your demo for the Advanced Reporting Dashboard which includes the Peace of Mind Certificate.